One of the important properties of metals is hardenability. Hardenability is the capacity of an alloy to be hardened by heat treatment. Hardenability is not same as hardness. There are a number of methods available for measuring the hardening response of a steel to heat treatment. 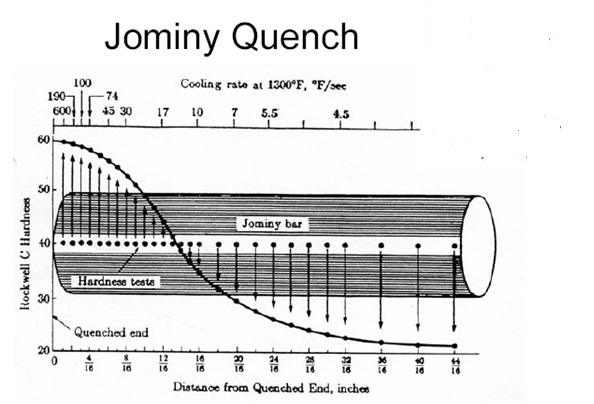 One of the most useful and widely accepted and the only discussed here is the Jominy test or Jominy end quench hardenability test. Here all the factors which effect the depth of hardening of steel, except composition are fixed or held constant. Any variations in the depth of hardening, therefore, reflect, a variation in hardenability. 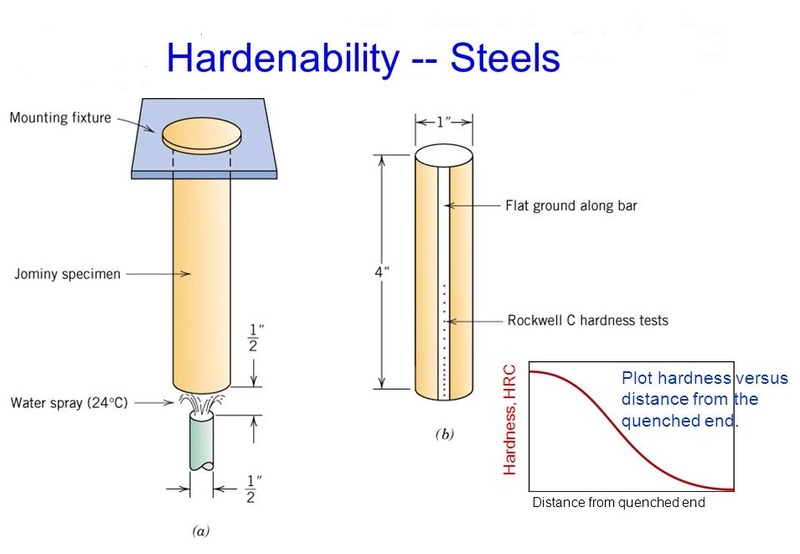 The data obtained from this test are relatively easy to interpret, appropriate plotting the hardenability of different steels may be readily compared. Further more Jominy test results are useful in prediciting the hardness at any location within a quenched steel part without a specific test, it is done on the basis of the steel. In this test we use the standard specimen consist of a cylinder rod either 100 mm and 25 mm in dia , alternatively 102 mm X(by) 25.4 mm is obtained. In making test the specimen is first heated to a suitable austenising temperature and held there long enough to obtain a uniform austenite structure. It is then rapidly placed in a jig, where it is held vertically and stream of water allowed to strike the end of specimen as shown in Fig.(1). 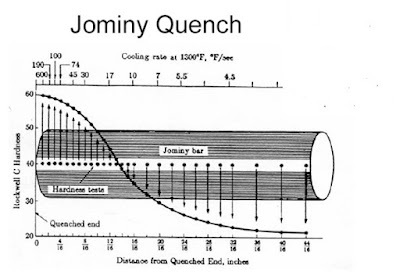 The cooling conditions within the Jominy bar during quenching change very little across the diameter but very rapidly at the end and progressively less rapidly at points towards the opposite end. After being thoroughly cooled, shallow flats are ground on the bar along the flats at 1/16" intervals for the first inch followed by reading at 1/18" intervals for the next 3/2" . A plot is made of the hardness reading against the distance from the quenched end of the bar. such plot is shown Fig. (2).